Amber Schumaker of Denver and Dane Fox of Canon City get into character and celebrate the Norse God of Winter in Parfet Park in downtown Golden. Linda Spencer and Heather Thomason Achtziger play with hula hoops on Jan. 26 in Parfet Park in downtown Golden during the fifth annual UllrGrass Music & Beer Festival. The two came with a large group from Erie to attend the festival to celebrate Shelly Miley’s birthday. Sandi and Bryan Lauersdorf of Golden enjoy beer and cider samples and live music at UllrGrass on Jan. 26. Hunker Down, a band from Winter Park, performs on Jan. 26 in Parfet Park in downtown Golden during the fifth annual UllrGrass Music & Beer Festival. Harry Bruno, a freshman studying materials and metallurgical engineering at the Colorado School of Mines, performs a cartwheel on a slackline at the fifth annual UllrGrass Music & Beer Festival on Jan. 26 at Parfet Park in downtown Golden. Laura Ukowich pours a Favorite Blonde beer at the Holidaily tent at the UllrGrass Music & Beer Festival. 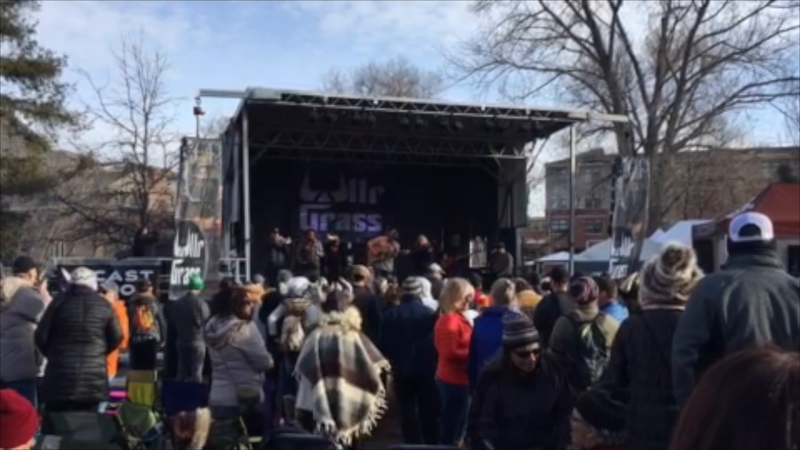 Hundreds of people filled Parfet Park during the days and the newly-renovated Buffalo Rose event space in the evenings in downtown Golden for the fifth annual UllrGrass Music & Beer Festival Jan. 25-27. The event featured a beer festival, family-friendly activities and three days of live music, hosting about 25 different artists performing a diverse lineup of bluegrass, newgrass, funk and jamband performances.